We invite you to discover the pleasure of cold-brewed coffee, chai and tea - a favorite of regular folk, connoisseurs and food critics since 1964. 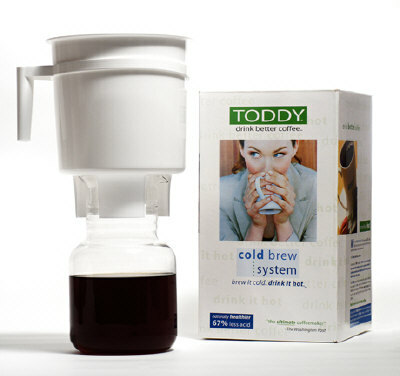 Toddy's exclusive cold water filtration process extracts the natural, delicious flavor of coffee, chai and tea yet leaves behind undesirable bitter acids and oils - resulting in a bold, super-smooth taste - served steaming hot or iced cold. Toddy's low acid solution has been praised by critics from The Washington Post and Cook's Illustrated to MSNBC.COM and The Saturday Evening Post. 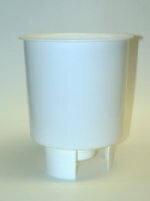 At Home: We offer several products for your home or office including The Toddy Cold Brew System [aka The Toddy Coffee Maker], specialty coffee beans, loose leaf teas, and pre-packaged espresso latte, chai latte and iced tea concentrates. Replacement glass decanters with lids for the Toddy Coffee Maker.